Knit one row, purl back, and knit another row before you begin with the wave pattern. Also always slip the first stitch of each row. I used 2.5 needles (European size) and the yarn is acutally my prefered sock yarn. ( Schoeller+Stahl Fortissima Mexiko Cotton Stretch) So my scarf is about 18 cm wide. Wave pattern: It’s a simple feather and fan stitch worked over 4 rows. 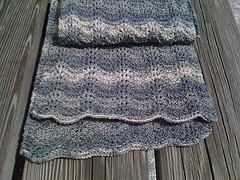 on August 5, 2011 at 11:10 pm | Reply Stacey S.
This is a lovely scarf! One question though. The needles: 2.5 European size. Does this mean 2.5mm needles? I can see myself searching for some lovely yarn to knit this scarf very soon! Yes, I’ve used 2,5mm needes.